This #1 CD sells more than any other at our stores. 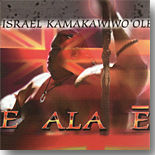 Another of my special favorites, this one always gives me goosebumps (chicken skin in Hawaiian) every time I play it! I truly love this CD!! The IZ/De Mello formula works well here again... the songs work all the expected buttons: passion, politics, friendship, love, mythology, ethnic pride, whimsy, a joking play with Gilligan's theme and a haunting memory of life in Kaua'i in track 9... a special one for treasuring that special time on the Garden Isle.